But in 2018, there is a multi-billion dollar industry that exists because of these games. Of course, the debate has been raging on for decades about which platform is the better one to play these games on. There are millions of Xbox gamers, while millions of others that use either the PlayStation or, the most popular method of playing video games—PCs. Deciding which of these platforms is better is an argument for another day. But one thing that cannot be argued about, even if you prefer another platform, is that PCs allow you a greater control over the quality of the games. If you’re someone concerned with the graphics, the FPS as well as the minute details of games, then you’ll find a PC is the best option. The best part of owning a PC is that you can continuously upgrade it. There are always options out there that can elevate your gaming rig and simultaneously raise your gaming experience. There are gamers out there that want the best of everything. 1080p, 60 FPS, and High Settings are simply not good enough. They continuously want to push the limits and have the absolute best at their disposal. For that, they need some heavy gaming gear. Here are some of the best additions you can make to your PC to maximize the fun and joy that comes from playing video games. If you’re a professional gamer or maybe someone who doesn’t game professionally but are incredibly passionate about it, then this is the CPU for you. There are multiple reasons why you should opt for this design. 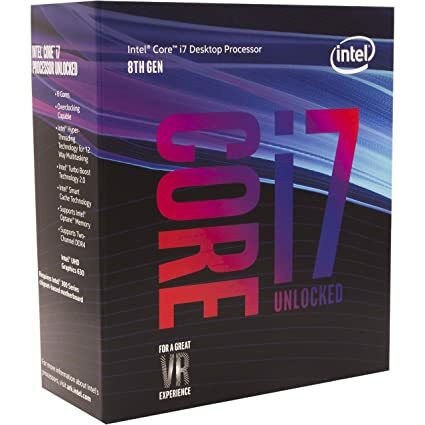 It has the highest stock clockspeed that Intel has ever offered on any of its machines. In addition to that, you get nearly six cores that provide a huge boost to your overall processing power. If you want a barometer to judge this performance, when compared to the previous i7-7700K, it provides 50% more cores, clockspeeds, and a better response time. There aren’t going to be many games that will require more than 4 cores. But this CPU has been designed to elevate your gaming experience, and these additional cores will ensure that. This processor was designed specifically as a response to AMD’s Ryzen. It manages to be a step ahead of its competitors in almost all categories. The only downside of getting this processor is that you’ll have to deal with a marginal over clocking headroom and you’ll have to install an aftermarket cooler. But that’s something that is expected if you have a beast of a device, which is what this processor is. What gaming PC would be complete without a graphics card that can exponentially increase its performance? If you’re someone that is not limited or even concerned by the price tag, then the GeForce GTX 1080 Ti and you are a match made in heaven. It is by far the best GPU that you can buy in the market right now. Now, there are some who would argue that the Titan V is the best GPU on the market but then you’d also have to factor in its price (which is 5 times more). For this reason, 1080 Ti is overall the best GPU you can buy right now. When you get a 1080 Ti, you get the absolute best performance at 1080p as well as 1440p. Depending on some other variations of your PC, it can also ace a game at around 4K Ultra. If you have the budget and can add a second 1080 Ti, then you’ve made a machine that can deliver on every front. There are multiple companies that offer the 1080 Ti— Asus, MSI, PNY, and Zotac. There are slight variations when it comes to cooling and clockspeeds but in the end, it’s a 1080 Ti. Here’s one solid reason to get the Samsung 970 Evo; it can deliver sequential read speeds of around 3,400MB/S. It can also write data at speeds that can reach 2,500MB/S. When you get this device for your PC, you can rest assured that those irksome loading screens will be a thing of the past. Another reason why you should consider this storage is the 1 TB storage that makes it possible for you to have an immense library of games. The only downside is that once you’ve gotten the taste of an SSD, it’s near impossible to go back to a standard hard drive. If you’re someone who uses features like the Steam Library Manager, then this is the device that will complement all of your gaming needs. It may not be as fancy or as glorified as some of the other devices on this list; however make no mistake, the power supply can make a hell of a difference in both your overall gaming experience as well as your everyday computational needs. The EVGA Supernova is the most efficient and perhaps the most powerful option to choose from. What makes it even more impressive is that it is a massive improvement on the still spectacular G2 Line. That in itself is no mean feat. When you buy this EVGA Supernova power supply, you get the peace of mind of having a 10-year warranty period. If you ever need to install a second GPU, then this device will be more than capable of handling it. Similarly, it increases the overall performance of your PC as it adds nearly 2% of efficiency to your machine compared to the previous T2 version. Got myself an i7-7700K and a 1080ti. FeelzGoodMan. Don’t forget to match this up to a decent 144hz (or higher) monitor, plenty on the market out there, but is a MUST have for any enthusiast gamer.